Sincerest apologies for missing last month’s roundup – the past couple of weeks have been quite busy! Nevertheless, we’re happy to present our selections of the most beautiful typefaces released last month. Let us know your thoughts! Muller is well suited for everything raging from advertising, packaging, editorial and branding, to web and screen projects. With a nod to the classic geometric sans serifs of the 20th century, Scandia builds a steady rhythm across its four weights and matching italics to create a versatile family of fonts. Snackbar is a classic hand lettered script that is sure to light up any layout. Piepie is very heavy typeface for titlings and captions. SS Community is a carefully crafted set designed for do-gooders. Boho is inspired by a bohemian girl who is a free soul and creative spirit. Haptic Script is a connected brush script with a warm, personal and soft character. GT Cinetype is a typeface with mechanical precision, but also a human element that shows its personality in the details. True North Textures is a vintage typeface with 18 fonts and a monoline script. Inspired by old nature field notebooks, Natura was born out of the passion for new modern hand calligraphy. A chromatic typeface inspired by vintage book covers. Snowberry is a modern, hand-painted brushed font family. Texta Narrow is a contemporary, rational, transparent and useful sans. A monolinear, dynamic, sans serif typeface with a uniform character width. Americane is inspired by old wood type specimen books – strong, decided and edgy. Chiavettieri is a robust, well balanced, legible typeface. 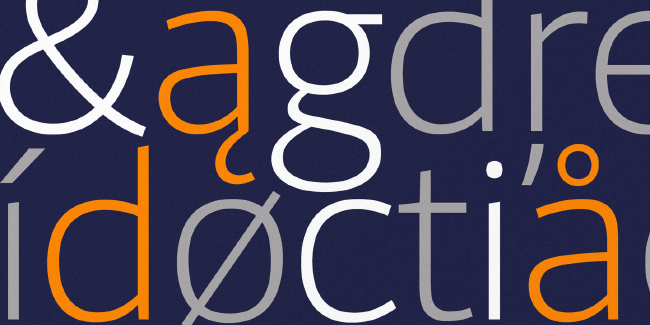 A highly graphic, fluid and dynamic typeface. Pobla was designed for body text in small sizes. A low contrast serif designed as a primary text face for newspapers. Druk Text is a display face designed for small sizes. Cardamon is an unobtrusive serif typeface which has a determined and straightforward demeanour. TT Bluescreens is a high quality font family which is designed specifically for cinephiles and directors. Geomanist is a modern, clean, linear and “geomanist” sans serif. Quantum Latin is a very friendly looking sans. Volte differentiates itself from the geometric sans pack through its simplification and reduction.